In 1867 a women’s group began playing, or at least putting, at St Andrews, supported by many including Old Tom Morris. Initially known as the St Andrews Ladies Golf Club, it later became the St Andrews Ladies Putting Club and is now The Ladies Putting Club of St Andrews. Ladies golf has come a long way since this time in the sport’s history. Now we are seeing ladies propel themselves to new heights in golf, sometimes even giving the men a run for their money. Since the days of the St Andrews Ladies Golf Club, the sport of golf has evolved leaps and bounds. From training methods to equipment to facilities, the modern game is packed full of state of the art elements. Golf attire has evolved along with every other aspect of the professional game and both amateurs and professionals alike know the value of wearing comfortable, breathable clothes while negotiating their favorite golf course. The polo weighs 5.3 ounces and is made from 100% polyester Dri-FIT fabric. The contrast Swoosh design trademark is embroidered on the left sleeve. Another feature included is pearlized buttons which complement the shirt colour, a mere shine off the buttons gives them a delicate contrast. The flat knit collar gives this revolutionary polo a traditional trademark, as the collar sits nicely on the shoulder area, and is comfortable on your shoulders and chest as you take your back swing. Ladies sizes range from S-2XL, accommodating all body sizes and types. 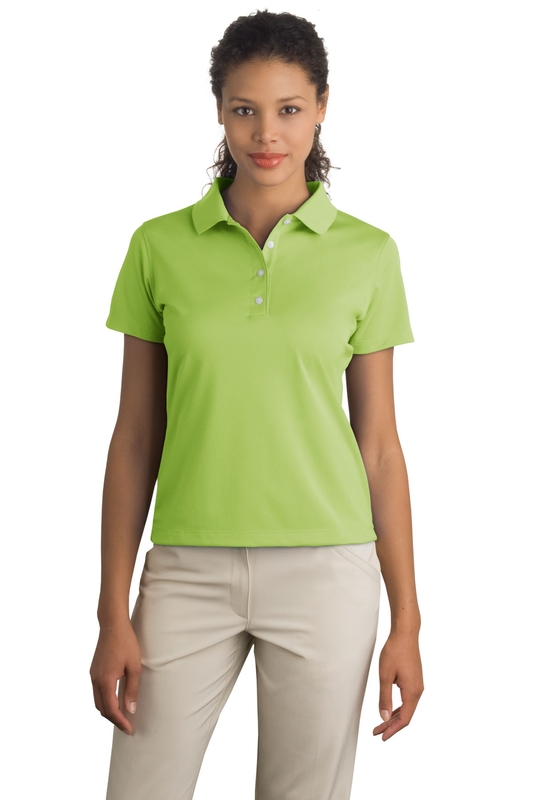 The Ladies Tech Basic Dri-FIT Polo comes in a wide variety of colours, including: Black, Flamingo, Lucky Green, Midnight Navy, Orange Blaze, Pro Red, Team Red, University Blue, Varsity Purple, Varsity Royal, Vivid Green and White. Other features include a three button placket and open hem sleeves, with the latter allowing air to circulate around you during a round of golf, especially handy when the weather is very hot, the last thing you need coming down the back 9 after a good start is to feel congested which can cause energy levels to drop significantly. So, when you are making your final preparations before beginning your play on the golf course, be sure to be up there with the elite golfers in the world, Tiger Woods and Rory McIlroy. This will at least be one place where you can begin to emulate these iconic figures.